Forget What Did: Too much of a mediocre thing. Too much of a mediocre thing. I came across an excellent book the other day. It was called 'What Will I Do With All Those Courgettes?' That's what I call a title. Straight away, the author has asked a question that demands to be answered. The potential reader may try to move on to read the spines of other books on the shelf, but a part of him or her will be unable to stop thinking. 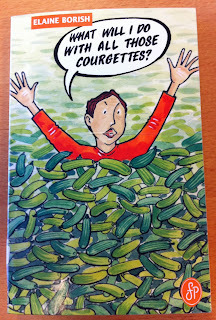 'Yes... but what will she do with all those courgettes? That's what happened to me, so I took the book down from the shelf. The front cover was... everything I could have hoped for. So, I had a look in the book, so that I'll be fore-warned and fore-armed if - when - the courgettes come for me. Now, perhaps you, like me, have at this point assumed that this is an eye-catching title for a book of recipes about dealing with all sorts of seasonal gluts. Courgettes, certainly, but also blackberries, tomatoes, apples... After all, this was a proper book-sized book - about 200 pages - it could hardly ALL be courgette recipes, could it? So, that's 'Pizza-with-anything', featuring as the primary ingredient 'basic pizza shell'. 1) Buy a pizza. 2) Put stuff on it. 3) Yeah, including courgettes. If you must. ...you know, I think they will. I think by the time you are rendered so desperate by the unstoppable influx of courgettes that you're reduced to sticking them in a chocolate cake, your friends will be pretty damn familiar with your 'secret ingredient'. Also, you won't have any friends. You'll be the weird courgette lady. Kids will throw stones at your house. And you will throw courgettes at the kids. You can donate them to spas. They'll slice them up and put them over posh women's eyes. Brussels Sprouts Are Not Just For Christmas. Well, darn! I had a HUGE piece of chocolate fudge cake just the other day. Now I can't help but feel cheated that it lacked courgettes. Pfft. 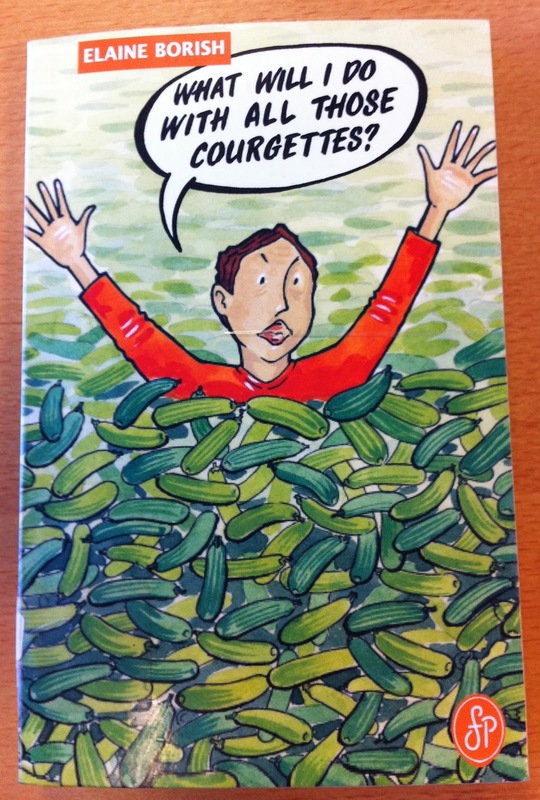 As an American, I had never heard the term "courgette" (and I worked in a garden-supply shop for five years!). My first thought prior to seeing the picture on the cover of the book was, "courgette... a female Corgi?" Which would not have made the title any less amusing, in my opinion. I had a friend give us over 20 courgettes the other day. I shoved them all in the freezer. Thanks to my lovely pal Catherine,(with whom I share a massive love of 'Cabin Pressure'....especially as I am from Ipswich and we get alot of mentions for some reason!) I was alerted to you latest blog post. Your blog always puts a smile on my face. I want to be a weird courgette lady when I grow up! John, I am someone who, overcome by courgettes at one point, made a courgette cake. Like a carrot cake, only greener. Also, if you leave courgettes to grow they turn into marrows. And then you're really in trouble! A friend of mine once made a chocolate courgette cake. She normally makes very good cakes but this was truly horrible. We all ended up scraping off the nice, normal chocolate icing and the cake itself went in the bin. If you ever end up with too many courgettes, a cake should really be the last thing you try to do with them. "You know what we need more of? 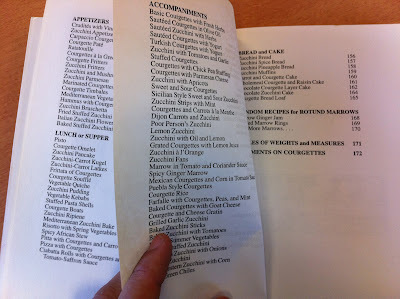 Courgette recipes!" Mrs. B: You're only allowed one! Archie: Who da heck wants more? **The ubiquitous US cucumberette pickled in dill,brine etc. 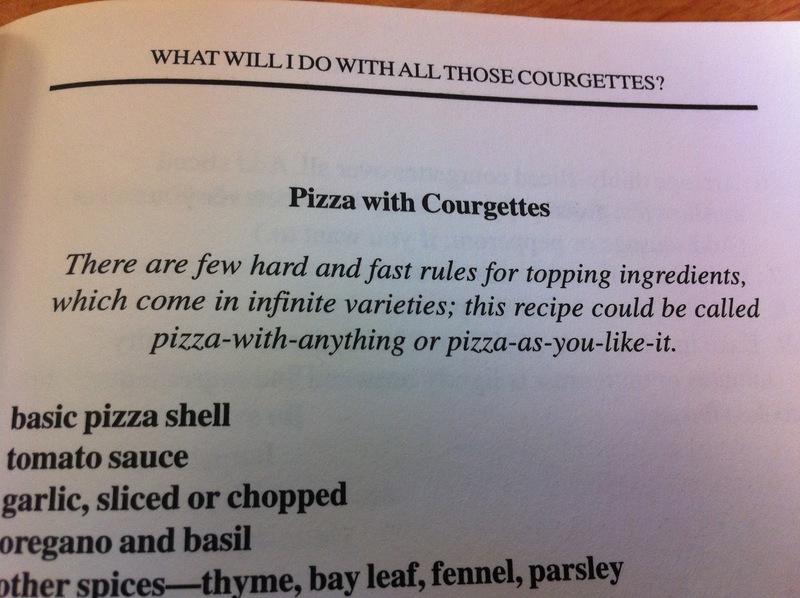 By any chance did the book include "courgette bread"? Zucchini bread is not unknown on this side of the pond. And there's always good ol' rotter twill. 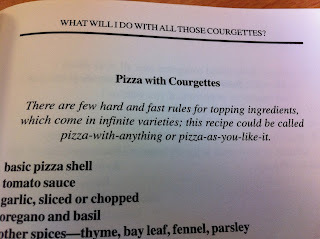 I had never heard the term 'courgette' before so my brain went to the nearest word in my lexicon, which is 'Corvette'. Now I have 'Little Red Courgette' stuck in my head. I need this book. Seriously. Zucchinis (as we refer to them more and more frequently in NZ) are taking over the garden...and I simply have run out of useful ideas for them that involve eating (though this book seems to have excluded ideas beyond food). That idea of throwing them at children though is VERY tempting...kids,listen up: INCOMING! And to Anonymous #1: I have had absolutely no luck when freezing them...they go all mushy when defrosted. Do you have a secret? (Sorry, John, for semi-hijacking your blog into a foodie-help line!). Aw, I thought it was going to be more like "Attack of the Killer Tomatoes". The oddest book I ever saw was entitled "Cluck: The true story of chickens in the cinema" (see http://www.amazon.co.uk/Cluck-True-Story-Chickens-Cinema/dp/0907080154/ref=sr_1_1?ie=UTF8&qid=1328769380&sr=8-1 if you don't believe me). It amazes me what sort of thing will sometimes find a publisher ... can we all say 'tax write-off', kiddies? Courgette brandy. courgette schnapps, courgette wine (a fine dry white with pumpkiny overtones and a hint of lemon squash), courgette and elderflower cordial, courgette poitin, mulled courgette Christmas spirit, baked otter and courgette casserole, courgettes in slivovice, courgettes in cassis - what a wondrously versatile vegetable (or fruit, to be pedantic)! They do go soggy when you freeze them, though a little less so if you chop and then blanch them in boiling water for a moment or two first. We've found the best way to get rid of the buggers is to grate them, freeze them, and then throw the resultant pulp into stews, chillis, & bolognaise type sauces. Like a stealth vegetable to bulk out the meat. Good for trying to shoehorn veggies down the children's throats rather than just throwing one at them. Ooh yum! I love courgettes, although every year we plant them and too many grow for us to harvest and eat before they get eaten by slugs / end up frozen (stupid British weather) / whatever, as unfortunately my family aren't as keen on them as I am. I can help but wonder how that omelette is prepared!!!! If you add some chopped courgette when cooking a Spanish omelette(tortilla de patata) you get a tasty variation of a really nice omelette!!! And anything about Pisto!!!! it has plenty of courgette on it and it is very nice too!!! That cover is sort of the best thing I've ever seen. They're like vegetable Tribbles! Gotta toss another courgette onto the rapidly accumulating pile - I certainly don't want mine (they hide under newspapers and sneak in your house when you're not looking if you leave near the fold in a map of the US). At least in here it might find a good home, or at least be repurposed into a knitted tea cosy, fluffy jacket stuffing, otter stunt double, flood barrier or etc. To @anonymous: Thanks so much for the info re:freezing courgettes/zucchinis. I'll give that a go. (Who knew this blog would ever serve up vegie advice?!). And "anthrowyn", I was thinking your fun "Little Red Courgette" posting would lend itself nicely to a flightdeck Cabin Pressure game of mis-heard song titles! !Can't get that out of my head now. There's a t-shirt from the otter episode of Cabin Pressure!!! Love that the book was able to cash the not-inconsiderable cheques the title was writing on its behalf. "Oh, I thought it would be a kid's book with pictures, with the lady having to find places to put all her courgettes." This gives me sinful thoughts. And embarrassment, since kids are supposed to see it. My brother lived in Montana for a while. He told me that during the courgette, or zucchini, season, folks had to lock their cars or else they would find them full of the darned things. They grew so big and plentiful, kids used them to make forts and then as projectiles. No one was safe. Baskets of the stuff would magically appear on doorsteps. Folks used them as doorstops and draft excluders. I rather like the look of despair on the character's face, I like to think it's due to having yet more vegetables thrust upon him. vegetable Tribbles! You made my day! Best StarTrek "villains" ever. therefore, no question: that book IS dearly needed! ahahaha! Thank you for supplying more giggles, Mr. Finnemore!!! And after reading all these delightful comments, my inner etymology nerd couldn't resist consulting my trusty Oxford English Dictionary and sharing that the "courgette" comes from French and "zucchini" comes from Italian (and is the North American, Australian and Kiwi equivalent). Sadly it doesn't explain why us English speakers have decided to create such a divide in the produce section. Do you yet have the faintest idea of when any of your shows will be recorded? You see, I'm going down to London for my 16th birthday present, and though my birthday was two days ago, we're putting off the trip until whenever Cabin Pressure orSouvenir Programme is recorded, so I'd be very grateful if that was in a school holiday! Happy saint valentine’s day i.e. the love and regards part of his patron saintage rather than the bees and epilepsy. In other words...you are excellent. Continue. Just to say thanks a million for so many laughs and jokes which my daughters & I have shared from Cabin Pressure. Yellow Car drives the family mad but I'm addicted, see what you started? Is an attraction to all things courgette listed in the latest Diagnostic Statistical Manual of psychological diseases (DSM5 to its friends)? You will have to try out the recipes and tell us how they are. This book is amazing! At least I won't have to worry about what kind of dessert to make for my dinner parties anymore. Over here in the states we have come up with a partial solution: August 8, which is officially "Sneak some zucchini onto your neighbors porch day." Just listened to, "The Now Show" staring John Finnemore. It was BRILLIANT! I'd rather eat my own leg than a courgette/chocolate cake. Thank you very much for the nice blog you write and which I have just discovered. Just wanted to mention that my mum makes courgette cakes whenever she has a glut of that mediocre veg. The cake itself is actually quite nice, though I guess the chocolate flavour helps a lot. It's a bit like banana cake but with courgettes instead, like the omelette you mentioned (as in the "substitute any spare veg here" sort of thing). I guess baking courgettes in cakes beats eating them in any other form! My friend and I bought this book, and made the chocolate courgette cake recipe. We are too embarrassed to send you the footage, despite the copious Finnemisms we included. By the end of this I was laughing so hard my entire office was sneaking glances at me. I think I will be skipping chocolate cake for a while. Please dont let Arthur near this. Martin and Douglas have enough trouble with Surprsing rice! Could you imagine what havok he could reek with Chocolate Courgett Layer Cake. Don't scoff ;-) the nicest cake I've ever made and eaten was a parsnip and maple syrup cake. Veg in cakes seems to work, though I draw the line at celery. We are starting a company during the summer where I work together with kids individually or during a camp. clients parents to check out throughout the summer.. I would like to begin a blog that everyone will read. In the end, my opinions are exceedingly important. Unquestionably imagine that which you said. Your favorite reason appeared to be at the net the easiest thing to remember of. placing the other person's blog link on your page at appropriate place and other person will also do same in favor of you. Hola! I've been following your website for a long time now and finally got the bravery to go ahead and give you a shout out from Kingwood Texas! Just wanted to say keep up the great job! invisible to everyone except you and stuff. help please DX. Hello every one, here every person is sharing these experience, thus it's nice to read this blog, and I used to visit this web site everyday. if you are not understanding anything entirely, except this paragraph provides nice understanding even. Three people I sat near this week.